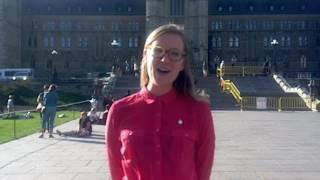 With the House rising yesterday, I've had the chance to reflect on the last month with Oliver‎ on Parliament Hill. It was a warm welcome and I am happy to be back at work, though it comes with a new set of challenges. I hope that sharing my experiences with others will start a conversation on how we can be supportive of new parents in politics. Please share your questions, past challenges or successes and your stories in the comments below! 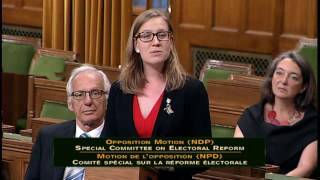 Avec la fin de la session parlementaire hier, j'ai eu l'occasion de réfléchir au dernier mois avec Oliver sur la Colline du Parlement. Ce fut un accueil chaleureux et je suis heureux d'être de retour au travail, même si cela comporte de nouveaux défis. 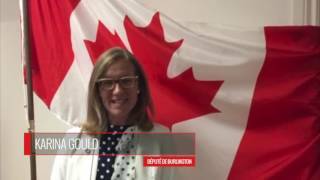 J'espère que de partager mes expériences participera à une conversation sur la façon dont nous pouvons soutenir les nouveaux parents en politique. SVP, partagez vos questions, vos défis passés, vos succès et vos histoires dans les commentaires ci-dessous! Added November 20, 2018 from Karina Gould, M.P..
One of the best parts of being a new parent has been the willingness of other parents to share stories about their children. I’m not superwoman and I know how important a strong support system is. I'd love to hear from you about how you've made it work and what more needs to be done to support new parents. L’un des meilleurs côtés à être un nouveau parent a été la générosité des autres parents de partager avec moi des histoires sur leurs enfants. Je ne suis pas une super-femme et je sais à quel point le système de soutien est important. 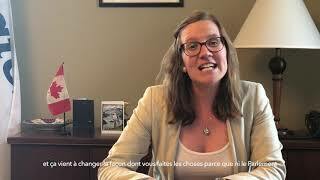 J'aimerais que vous me disiez comment vous y êtes arrivés et ce qu'il faut faire de plus pour soutenir les nouveaux parents. Being back in Burlington has provided me with some time to reflect since I filmed this video. Balancing constituency work, ministerial responsibilities, House duties like Question Period and votes, meetings with staff and stakeholders, public and community events is always a challenge; add a new baby to the mix and there is another adjustment. I was surprised feeding my baby made the national news... after all, I’m not the first mom to breastfeed a newborn. But hey, we’re all learning together. 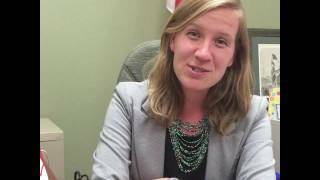 Être de retour à Burlington m'a permis de réfléchir depuis que j'ai filmé cette vidéo. Équilibrer le travail de circonscription, les responsabilités ministérielles, les tâches de la Chambre des communes comme la période des questions et les votes, les rencontres avec le personnel et les intervenants, les événements publics et communautaires est toujours un défi; ajoutez un nouveau bébé au mélange et il y a un autre ajustement. J'ai été surprise de voir que nourrir mon bébé aie fait les nouvelles nationales ... après tout, je ne suis pas la première mère à allaiter un nouveau-né. Mais bon, nous apprenons tous ensemble. 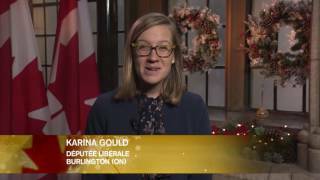 Added January 23, 2018 from Karina Gould, M.P..
Burlington MP Karina Gould, Minister of Democratic Institutions - the youngest female Minister in Canadian history - is featured. 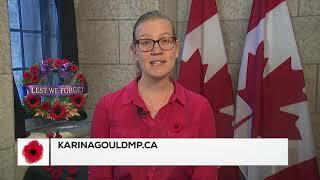 Added January 16, 2018 from Karina Gould, M.P..
Added August 28, 2018 from Karina Gould, M.P..
Added December 21, 2017 from Karina Gould, M.P..
Added July 4, 2017 from Karina Gould, M.P..
Peter Mansbridge sits down with three young political leaders to discuss what comes next for Canada following its milestone celebration. »»» Subscribe to The National to watch more videos here: https://www.youtube.com/user/CBCTheNational?sub_confirmation=1 Voice Your Opinion & Connect With Us Online: The National Updates on Facebook: https://www.facebook.com/thenational The National Updates on Twitter: https://twitter.com/CBCTheNational The National Updates on Google+: https://plus.google.com/+CBCTheNational »»» »»» »»» »»» »»» The National is CBC Television's flagship news program. 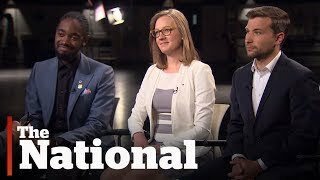 Airing seven days a week, the show delivers news, feature documentaries and analysis from some of Canada's leading journalists. 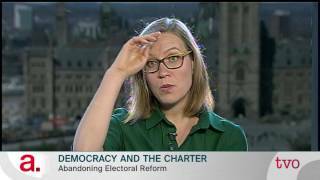 Added November 22, 2017 from Karina Gould, M.P..
On the 35th birthday of the Charter of Rights and Freedoms, Canada's youngest ever female cabinet member, Minister of Democratic Institutions Karina Gould joins The Agenda to discuss the Charter's democratic elements, her government's abandonment of electoral reform and what's on the mandate letter she recently received. 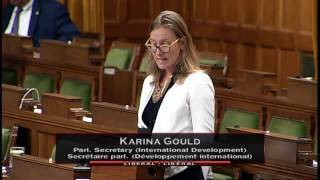 Added May 29, 2017 from Karina Gould, M.P..
Hi. 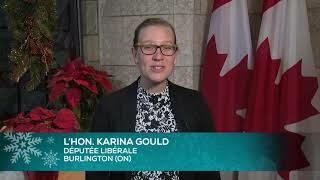 I'm Karina Gould, your Member of Parliament for Burlington. 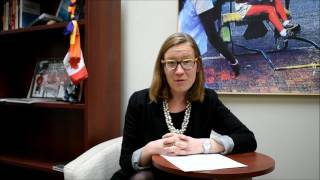 From May 28th to June 3rd, we're celebrating National AccessAbility Week here in Canada. This is a week where we can think about how we can make our Canada even more accessible and more inclusive. Accessibility is about everyone being able to participate to their fullest ability and to be able to succeed in their community, their school or their workplace. 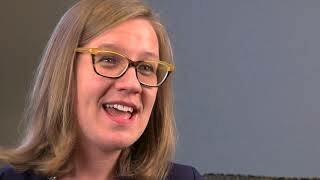 Join me this week in changing how we think and how we approach accessibility. We can do it right from the start. It is possible. This week we are celebrating our accomplishments here in Canada and how we can make progress when it comes to accessibility and an inclusive Canada. 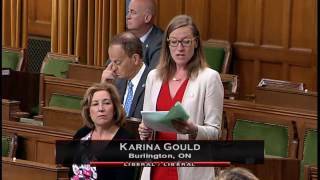 Added May 26, 2017 from Karina Gould, M.P..
Hi, I am Karina Gould, Your Member of Parliament in Burlington. Today marks the beginning of the celebration of Ramadan. Ramadan is celebrated by Muslims throughout Canada and across the world. It's a time to fast, to reflect and to pray. During this 150th year its a time for all of us to think about the contributions that our vibrant Muslim communities have made here in Canada. I wish you peace and happiness and of course a very happy Ramadan. Ramadan Mubarak! 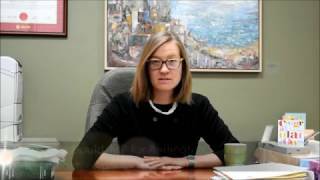 Added May 1, 2017 from Karina Gould, M.P..
Added April 24, 2017 from Karina Gould, M.P..
Today, on Yom HaShoah, Holocaust Remembrance Day, we take the time to remember the 6 million Jews and 5 million others who lost their lives during this tragic time. This is a part of our history we must remember. We must remember all those, the innocence, that lost their lives because of hatred and violence. Today, I remember. 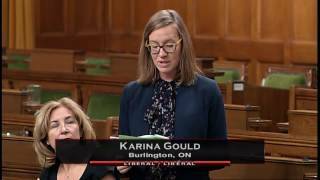 Added April 22, 2017 from Karina Gould, M.P.. It's National Volunteer Week and it's the perfect time for us to say thank you and to celebrate all those that have given the gift of your time, your skills and your energy to the causes that matter to you. 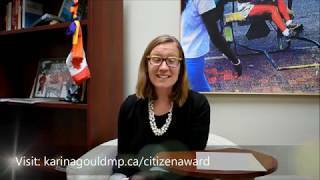 Whether you are a professional who is lending your skills to those who might benefit from them or whether you're giving the gift of your time in order to deliver meals or plant trees or to participate that is important for you and those in our community, you are united regardless of your age, your gender and your background in providing a social good in our community. I want to personally say thank you to all of you for all that you do to continue to build, to enrich and to ensure that everyone here in our community thrives. Thank you to all of you who volunteer in our community, Happy National Volunteer Week. 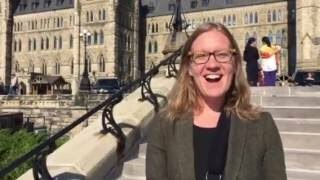 Added April 21, 2017 from Karina Gould, M.P..
On April 22nd, millions of people around the world will come together to support our natural environment. Right here in Burlington, hundreds of us will be participating in Burlington Green's annual Clean Up Green Up, taking the time to pick up garbage and to clean our public spaces. As you celebrate Earth Day tomorrow, think about the way that you too can become a better friend to the environment. Whether it's walking to the store instead of driving or participating in one of the clean-up activities, thinking about composting or even planting a vegetable garden, there are many ways that you can show your appreciation and provide your support for our clean air, water, and land. I invite you to come join us at the celebrations for the Eco-Fair at 1 pm at the Burlington Central Library Bandshell. Happy Earth Day to everyone celebrating here in Burlington. 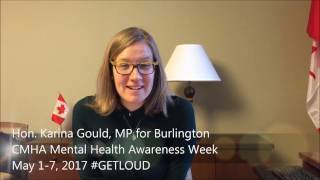 Added April 13, 2017 from Karina Gould, M.P.. I want to wish all those celebrating this weekend a very Happy Easter. 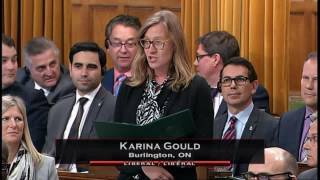 Added April 10, 2017 from Karina Gould, M.P..
Today we mark the beginning of Passover. I'd like to begin by wishing all the Jewish communities in Canada and around the world a very happy Passover. I grew up recounting the tale of Passover over my family's dinner table. It's one that reminds us of what we have today and the struggle our people went through before. Really wishing everyone a happy Passover this year. 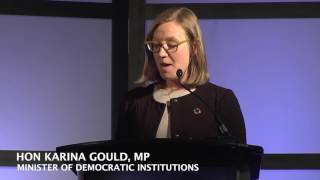 Added April 6, 2017 from Karina Gould, M.P..
On March 23rd, MP Gould addressed hundreds of young women on choosing a career in politics. Women as Career Coaches organized by HIEC is an inspiring evening that brings high school students and professionals together to talk and share about potential career choices. 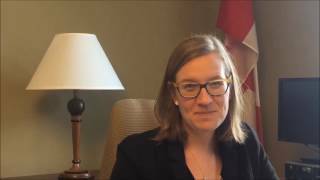 Added April 3, 2017 from Karina Gould, M.P..
Added February 17, 2017 from Karina Gould, M.P..
SummerJobs Program: Feb 3rd Deadline! 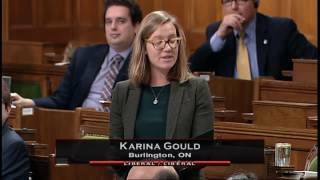 Added February 2, 2017 from Karina Gould, M.P.. Calling all students between the ages of 15 - 30 as well as local small businesses, non-profits and public sector organizations! 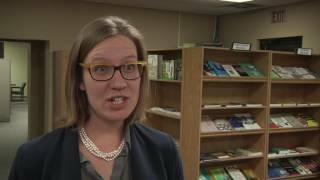 Burlington MP Karina Gould has the details of this year's summer jobs program, plus we speak with HIEC, an organization who participated last year. 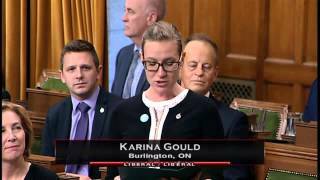 Added December 19, 2016 from Karina Gould, M.P..
Added December 8, 2016 from Karina Gould, M.P..
Mr. Speaker, yesterday, International Volunteer Day, we celebrated the millions of Canadians who volunteer in their communities and abroad to make the world a better place. Today, I would like to thank the people in my community who give so generously of themselves. People like Bob Pring, a volunteer at the art gallery in Red Cross, Burlington's senior person of the year, who works with the Wood Carvers' Guild to carve beautiful and unique canes for military veterans; Chuck Learn with Children of Christmas Past has spent the last decade delivering thousands of gifts across southern Ontario to seniors who spend the holidays alone; and Esperanza Peacock, devoted and enthusiastic, has spent countless hours helping newcomers to Burlington navigate the city and find their place in the community. 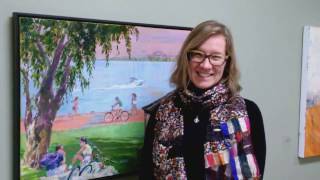 These are just three examples of the wonderful people who volunteer their time and talents in Burlington. 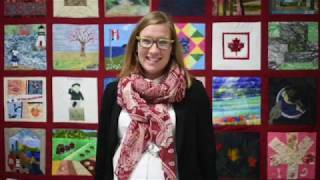 We thank all of Canada's volunteers, at home and around the world, for strengthening and enriching our social fabric. They truly make a difference. 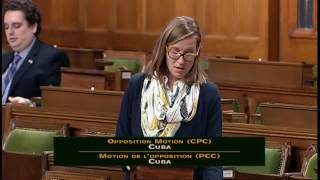 Added December 2, 2016 from Karina Gould, M.P..
On December 1, I had the opportunity to speak on the Conservative Opposition Motion - on the death of Fidel Castro and the importance of Canada's commitment to the Cuban people. 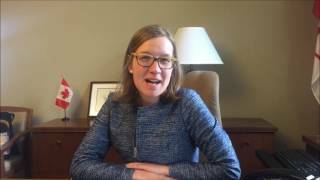 Added December 1, 2016 from Karina Gould, M.P..
On November 29, I had the opportunity to speak on Bill C-26, An Act to amend the Canada Pension Plan, the Canada Pension Plan Investment Board Act and the Income Tax Act. 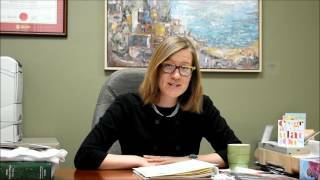 Added November 28, 2016 from Karina Gould, M.P..
Mr. Speaker, I am honoured to rise in the House today to present a petition requesting the government to consider palliative care. 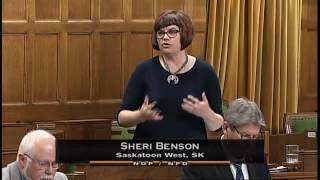 Residents in my community have asked that the government consider putting palliative care as a defined medical service under the Canada Health Act. They request the House of Commons and Parliament to specifically identify hospice palliative care as a defined medical service covered under the Canada Health Act so that provincial and territorial governments will be entitled to funds under the Canada health transfer system to be used to provide accessible and available hospice palliative care for all residents of Canada in their respective provinces and territories. 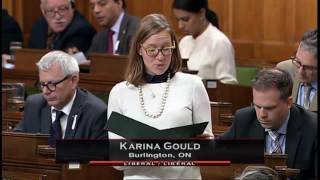 Added December 5, 2016 from Karina Gould, M.P..
Mr. Speaker, last week I had the opportunity to participate in Burlington's commemorations to honour our veterans. Today, I would like to thank the members in my community who made this week special for those who have served. I want to thank the Burlington legion, the Burl-Oak Naval Veterans, and some of the amazing individuals who give generously to honour our veterans: Kristin Courtney, who organizes a veterans luncheon every year in Halton; Bill Reid the “Singing Veteran”, who shares his songs of war with the commuters at Burlington GO stations, and who for almost three decades has provided services at retirement homes for the veterans who are not able to attend the official events; and, the Grade 12 drama students at M.M. Robinson High School, who each year write and direct a play on Remembrance Day, and who deserved a standing ovation as their story was heart-wrenching, honest and passionate, and truly honoured the veterans who were present. We must take a moment every day to think of our Canadian men and women who have served and who are currently serving. Our veterans serve our country with bravery, honour and dignity and I want to say thank you. Thank you for protecting the values we cherish and making our world a safer place. 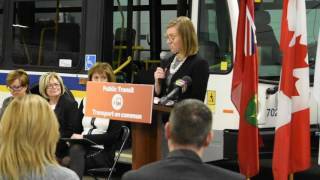 Added November 10, 2016 from Karina Gould, M.P..
Added October 28, 2016 from Karina Gould, M.P..
Mr. Speaker, On October 15, I had the opportunity to celebrate one young boy’s determination in revitalizing an important space in his community. 11 year old, Griffin Gervais, was disappointed that his baseball diamond at Lakeshore Public School was in rough shape and not scheduled for an update. Rather than just accepting the fact, Griffin decided he would lead the effort to repair the diamond Starting last January, Griffin, with the help of his family, classmates, his community, and the City of Burlington’s Neighbourhood Community Matching Fund raised a total of $12,000. Today, with two updated benches, new chain-link fencing and a freshly mowed field, the Lakeshore Public School Diamond now looks better than ever. Griffin’s story is one that is truly inspiring and shows that anyone can make an impact on their community if they set their mind to it. Thank you Griffin for all of your hard work and it was inspiring to see you throw the first pitch on the field. 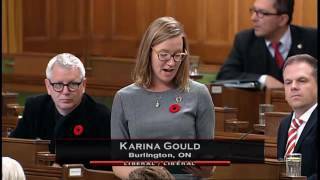 Added October 19, 2016 from Karina Gould, M.P.. 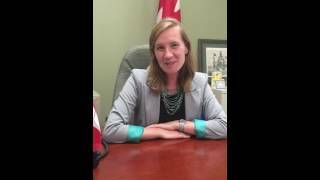 Thank you Burlington for electing me as your Member of Parliament 1 year ago today. 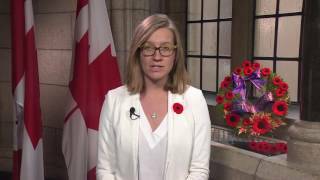 It continues to be an honour and a privilege to serve you in Ottawa. I am proud and humbled to represent you every day. Added October 17, 2016 from Karina Gould, M.P..
Have a very happy Thanksgiving weekend! 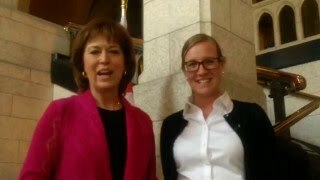 Thank you Mr. Speaker, En cette Journée Internationale de la Fille, nous avons l’opportunité de reconnaître les filles et les jeunes femmes comme puissantes agentes de changement. 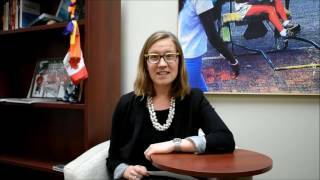 As part of the campaign “Because I am a Girl”, today and tomorrow, young women advocates from Plan International Canada, will step into the shoes of a Cabinet Minister or an opposition colleague, and participate in a busy day on the Hill. We all in this house value the crucial role that young women can - and should play. Pour faire de l’égalité entre les sexes une réalité, nous devons tous être impliqués. Le Canada est fier d’aider les jeunes filles à atteindre leur plein potentiel et à apporter une influence positive au sein de leurs communautés et à travers le monde. When girls are educated, healthy, safe from violence, and empowered, they can have a positive impact on their families and their communities. As parliamentarians we have a role to play in shaping the policies and the laws that will allow all girls around the world to realize their dreams. To learn more about their journey to Ottawa follow #GirlsBelongHere! 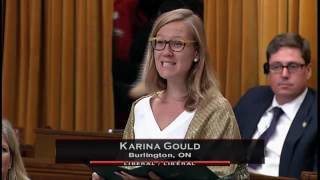 Added September 29, 2016 from Karina Gould, M.P..
Added September 28, 2016 from Karina Gould, M.P..
Mr. Speaker, this past Saturday, Halton Women's Place held its seventh annual Hope in High Heels event in my riding of Burlington. Boys and men of all ages from 8 to 82 including our mayor, fire chief, Halton police, labour, business, and sports leaders, and my husband and my brother all slipped into a pair of hot-pink heels and strutted in solidarity with Halton Women's Place to fight to end violence against women. The message is simple: we will not end violence against women and children if boys and men are not included in the conversation and part of the solution. I thank all the boys and men for their leadership and their positive role modelling to help raise awareness and funds for a heroic organization in my community that provides vital support for our most vulnerable in their time of need. I was thinking that the event was such a success this weekend in Burlington that maybe we should organize a Hope in High Heels on the Hill. Are you up for it, Mr. Speaker? 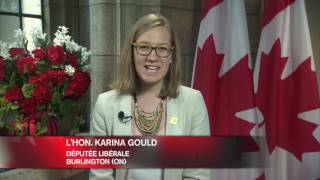 Added September 26, 2016 from Karina Gould, M.P.. Script: In 2003, 400,000 people had access to anti-retro viral treatment; today, there are 17 million people receiving treatment to fight HIV/AIDS. This huge increase is thanks to the efforts of the Global Fund to fight aids, TB and malaria. Je suis incroyablement fière que notre gouvernement contribue à ce combat à hauteur de $804 millions, et aie été capable d’amasser près de $13 milliards, ce qui contribuera à sauver 8 millions de vies. The lives of young people like Ahmed Habré, Loyce Maturu and Ashley Murphy who are not only living with HIV but are strong activists because they have access to treatment. They made it clear that our legacy to future generations has to be the eradication of these diseases by 2030. HIV and TB disproportionately affect the world’s most poor and most vulnerable and as Mark Dybul, of the Global Fund said, we can beat these epidemics, we just need to be better humans. C’est pour les millions de personnes à travers le monde qui souffrent du VIH, de la tuberculose et du paludisme que le monde s’est réuni à Montréal le weekend dernier afin de mettre fin à ces épidémies pour de bon. 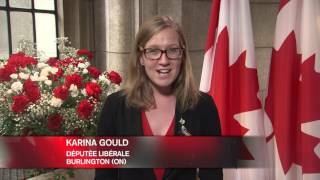 Added September 15, 2016 from Karina Gould, M.P..
Added September 7, 2016 from Karina Gould, M.P..
Added July 21, 2016 from Karina Gould, M.P..
Added July 20, 2016 from Karina Gould, M.P..
Added July 5, 2016 from Karina Gould, M.P..
Added June 30, 2016 from Karina Gould, M.P..
Added June 7, 2016 from Karina Gould, M.P..
Added May 12, 2016 from Karina Gould, M.P..
Added May 24, 2016 from Karina Gould, M.P..
Mr. Speaker, I am pleased to rise today to speak during Mental Health Week. 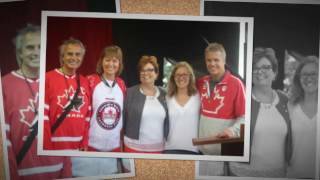 Brian Hansell, a father from my riding, founded the Paul Hansell Foundation in memory of his son. The Paul Hansell Foundation looks to break down barriers and establish a proactive and preventive dialogue that puts mental health on an equal footing with all other forms of health. The conversation plate initiative was created to get people talking about all aspects of mental health. Today, the foundation will celebrate the official conversation plate launch at Assumption Catholic Secondary School in Burlington. Assumption students will be performing their play Beneath Our Skin, which sheds light on difficult mental wellness issues. 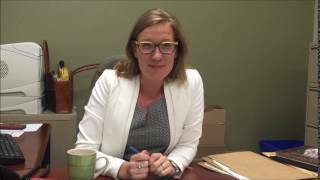 This past weekend, I had the opportunity to make my own conversation plate, and I am proud to take the lead on a conversation thread here in the House. I congratulate Brian, the foundation, and Assumption students on this important issue, and look forward to sharing this plate and this conversation with my colleagues.